There is something deadly serious about Andrei Zvyagintsev's Elena that is evident right from the start. It all begins as a somewhat straightforward domestic drama. Zvyagintsev introduces us to Elena (Nadezhda Markina), an aging housewife and former nurse, who is married to a wealthy, emotionally distant doctor named Vladimir (Andrey Smirnov). Both have children from previous marriages, and Elena's son is an unemployed ne'er-do-well who cannot support his own family. Vladimir has no such patience with such irresponsibility, much less when her son relies on his mother for support, and his financial dependence on Elena is a constant point of contention with Vladimir. However, Vladimir's sudden illness puts those concerns on the back burner, and the reappearance of his estranged daughter adds a whole new set of complications. Thrilled to be reunited with her after so many years, yet suddenly faced with his own mortality, Vladimir decides to rewrite his will - so that his daughter is the sole recipient of his wealth. Nadezhda Markina as the title character in ELENA, a film by Andrei Zvyagintsev. Now facing a lifetime of insecurity with a dependent son and his needy family, Elena is presented a nearly impossible situation - a situation that will lead her to an unthinkable decision that will test just how far she is willing to go to save herself, and her children. Elena is a slow burner. Zvyagintsev allows the tension to simmer over the course of the two hour running time, running on undercurrents of familial strain and fabulous selections from Phillip Glass' "Symphony No. 3." It's almost so understated as to be nonexistent, which is part of what makes it so effective. Zvyagintsev expertly evokes the naturalistic drudgery of life in the Russian bourgeoisie. Elena herself is caught between two world, the lower class world of her roots and the upper class world she married into, bridging the gap over a nonexistent middle class. In a post-Communist Russia, Elena represents a kind of social Darwinism of a country in transition. In that regard it's a deeply cynical film, an austere commentary on what happens when upper class coldness meets lower class desperation. Zvyagintsev's grim vision of human nature is certainly tough, and requires some patience to dig into, but it's a compelling journey. Markina's performance as the titular character is a remarkable study in understatement and unspoken pain, much like the film as a whole. Just when it feels like the film is going nowhere, Zvyagintsev hits us with a punch to the gut that is hard to shake. The questions Elena raises linger long after the final shot, a haunting mirror of its opening that paints a bleak picture of the future. While its outlook may be pessimistic, there's something strangely alluring about its chilly, graceful darkness. Its meticulous construction accompanied by Markina's performance make Elena a riveting domestic thriller, an elegantly crafted glimpse into modern Russian life that speaks volumes while barely saying a word. 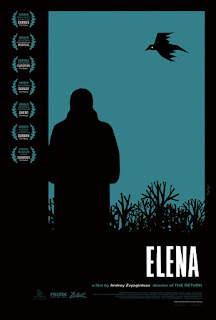 ELENA | Directed by Andrei Zvyagintsev | Stars Nadezhda Markina, Andrey Smirnov, Yelena Lyadova, Alexey Rozin | Not rated | In Russian with English subtitles | Now playing at the Film Forum in NYC. Opens in LA May 25.